By staying active, I feel that I was better able to cope with the physical changes of pregnancy and have built stamina for the many challenges ahead. 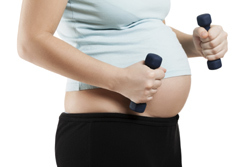 I encourage all expectant mothers to discuss exercise plans with their doctor. Once you have gotten clearance, get out and be active! Sarah Holland, MSc, RD, CNSC, LDN, is a clinical dietitian at Rush University Medical Center. This entry was posted in Exercise and Physical Fitness, Women's Health and tagged exercise, fitness, pregnancy. Bookmark the permalink. Another starting point is the exercise book/ VHS, DVD by Jane Fonda that she made in the 1980’s. She made it popular and acceptable for women to exercise while pregnant.